It’s no secret that windows are one of the most important factors of what determines a building’s energy efficiency. 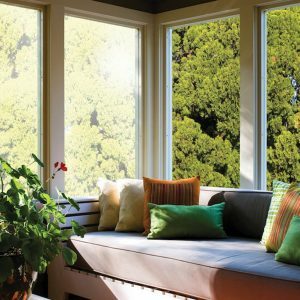 On average, about 30% of energy waste can be contributed to windows that are poor performing and lack insulation. If energy costs are unusually high for a building, then it’s likely got something to do with the windows. There are generally two options for remedying this issue. The windows can either be replaced with low-e glass or retrofitted with window film. But which is the better option? To shed some light on this matter, we asked our Denver window tinting technicians about the pros and cons of low e windows vs window replacement. Which Is Better: Window Tinting or Low-E Windows? Window tinting and low-e windows are both effective ways of remedying issues with energy efficiency. However, determining which options is best for you requires multiple factors to be taken into consideration. Aesthetics, return on investment, and the quality of materials all have to be considered. In the past, the most common solution was to install windows with tinted glass. Architects found these windows effective at reducing heat, but the problem was these windows relied on cheap dyes to reflect heat and therefore they also reduced visible light transmission too. Later, low-e technology was invented which allowed glass to control heat transfer rather than reflect it. Many people still believe low-e windows are the better solution. But even this option can be problematic because the cost of investment is so high that homeowners almost never receive a full payback within the time period of living in their home. That’s why more and more people are turning to low-e window film as an alternative. Low-e window tinting uses the same technology as energy efficient windows, but it doesn’t require that the entire window unit be replaced. The glass can simply be enhanced and modified by applying the film on top. Once in place, the film works to keep heat in place so that too much of it doesn’t transfer through the glass at one time. The result is a more stable temperature indoors. Is the money you spend on energy costs going right out the window? Start saving on energy costs in Denver with window tinting for your home or office. Call us today to get started.